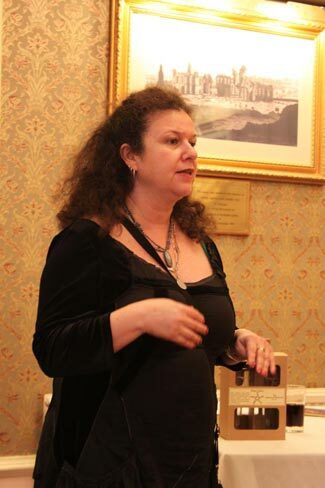 The 2012 Occult Conference was held on Saturday, 17 March at the George and Pilgrim Hotel and Pub in Glastonbury. 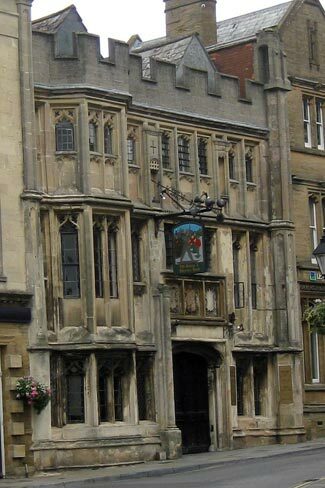 The George and Pilgrim, the oldest purpose-built public house in southwest England, was originally constructed in the 1400s to accommodate pilgrims journeying to Glastonbury Abbey. Glastonbury was a magnet for spiritual tourism long before the Abbey was built and it remains so today, as evidenced by the packed attendance at the Speakeasy. Many traveled from far afield to attend. Josephine McCarthy described Inner Work. I discussed saints, both authorized and unauthorized. Many find the concept of unauthorized saints to be even more arcane than Hoodoo. (While Hoodoo has historically been exclusively magical, rather than religious, its most recent evolution involves veneration of both official and unofficial saints. You’ll find discussion of Hoodoo in several of my books, including Pure Magic, The Encyclopedia of 5000 Spells, and the new Encyclopedia of Mystics, Saints, and Sages.) It is commonly assumed that all saints are canonized Christian saints, but, in fact, saint veneration predates Christianity and is a phenomenon shared by many spiritual traditions. Every day is some saint’s day and as the Speakeasy was held on 17 March, there could be no discussion of saints without mentioning St Patrick. Downstairs, in the pub, there was plenty of wearing of the green to honor Ireland’s most beloved saint. Ironically, there seemed to be little celebration of a saint of tremendous local import, who shares Patrick’s feast day: Joseph of Arimathea. This saint, the other significant Joseph in the life of Jesus, plays a pivotal part in the history of Glastonbury. Having acknowledged Patrick and Joseph, who, while canonized, possesses some unauthorized aspects of his own, my talk then focused on unauthorized saints. An excellent question from a Conference participant led to discussion of Argentina’s Difunta Correa. Other unauthorized saints discussed include Juan Soldado, Jesus Malverde, Maximon, Judas Iscariot, and the highly controversial Santa Muerte (Saint Death). Among my prized souvenirs brought home from the Conference is a signed poster of artist Stuart Littlejohn’s Santissima Muerte. And if you haven’t seen Littlejohn’s divine sacred and magical art, well, you should. Here’s a link to the website he shares with Josephine McCarthy: http://www.theinnerlibrary.org/ His work is available through his website and at the Saint Martha Botanica at 10 Benedict Street, Glastonbury. Santa Muerte’s presence in Glastonbury indicates just how far this much maligned saint has traveled. Twenty years ago she was little known outside Mexico. Today, she is beloved worldwide. Santa Muerte is somewhat of an anomaly among saints, who are traditionally defined as the souls of those once living, who, although now dead, have not departed the mortal realm, but remain to provide miraculous assistance to the living. Santa Muerte, however, is the embodiment of Death. Some consider her a modern incarnation of the Aztec Lady of Death, Mictlancihuatl, while others perceive her as an angel of death, something akin to the archangel saints, Raphael, Gabriel, and Michael. (Michael’s presence is also exceedingly potent in Glastonbury—his tower atop the Tor dominates the landscape– but that’s the subject of another blog post.) Some would classify her as a goddess, like Kali or Baba Yaga. The title Santa, however, clearly identifies Santa Muerte as a saint. Within the context of a Catholicized culture, an unauthorized saint is still more generally acceptable than any other kind of spiritual being. Much confusion regarding Santa Muerte exists and she is continually misrepresented in popular and conventional media. No, she does not require blood sacrifices and no, she will not kill one of your loved ones as payment for favors granted. 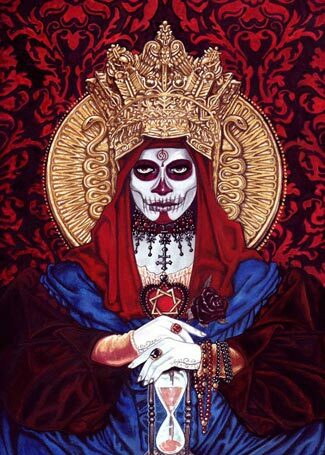 Detailed, lucid information regarding Santa Muerte, as well as magic spells associated with her, may be found in the Encyclopedia of Mystics, Saints, and Sages. Also found in that book are other skeleton saints, such as Argentina’s San La Muerte and the Mayan Pascualito and El Rey Pascual, as well as all saints discussed in this blog post, both authorized and unauthorized.